My wife and I did a bike trip in Holland a few years ago. 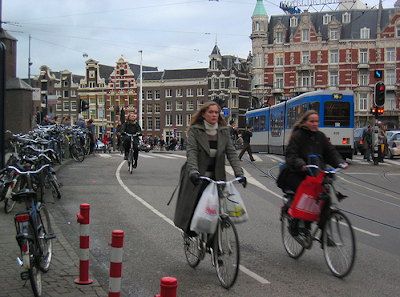 The infrastructure makes biking a great way to get around. The people are also fantastic. If we stopped to consult a map, other riders would stop and help us out. I was amazed at the number of people who speak English there. And one day I got a flat tire in the pouring rain, and we stopped by a building to fix it. A huge smiling man pedaled over, spoke no English, took my tire from my hands and proceeded to fix my flat. He handed it back fixed, smiled, and rode away. Yes, it's a great place to cycle. We emigrated here from the UK largely for that reason. We've taken lots of photos and videos, compiled a list of articles and have a blog about how this has been achieved.